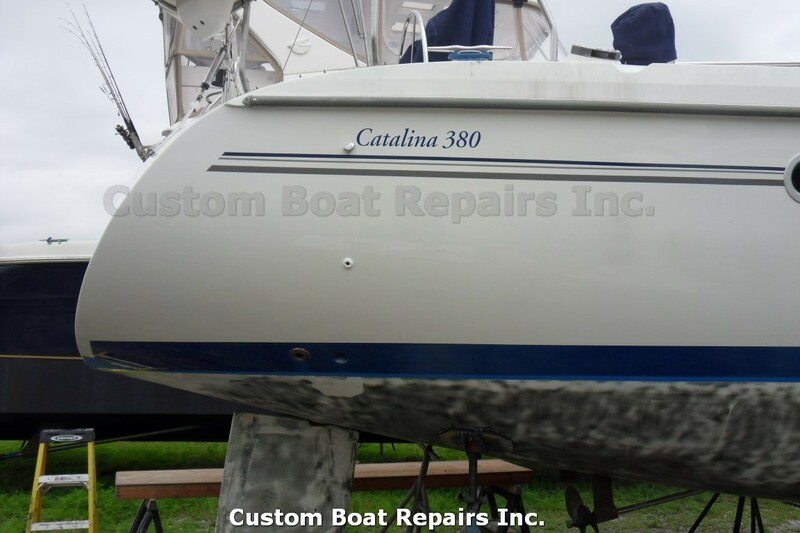 This is a Catalina Sailboat 380. 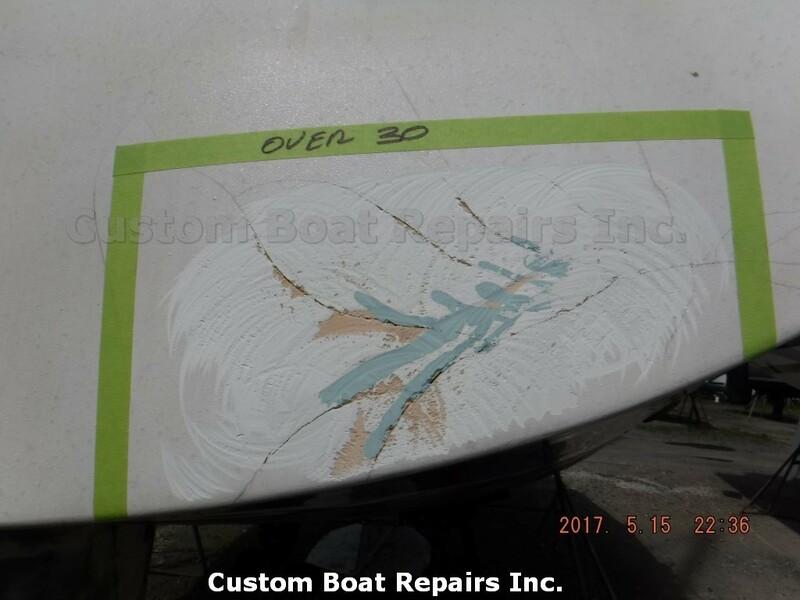 Over the years, the owner was taking care of transom cracks himself (you'll be able to see the cracks in the photos that follow). The owner would notch out the cracks, fill them in, and the next year they would come back. 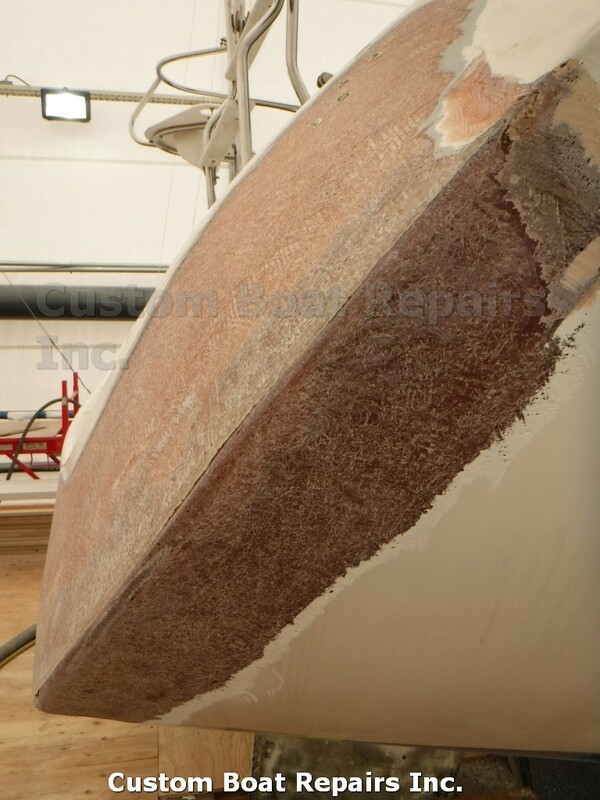 Also, below the waterline, the putty that the factory used to flare off the hull started to peel away. This was getting to be a serious problem. So the owner got in touch with me to see if could help him out, and I told him that I could. I had to investigate why these cracks where occurring. My moisture meter was reading that the transom was very wet. 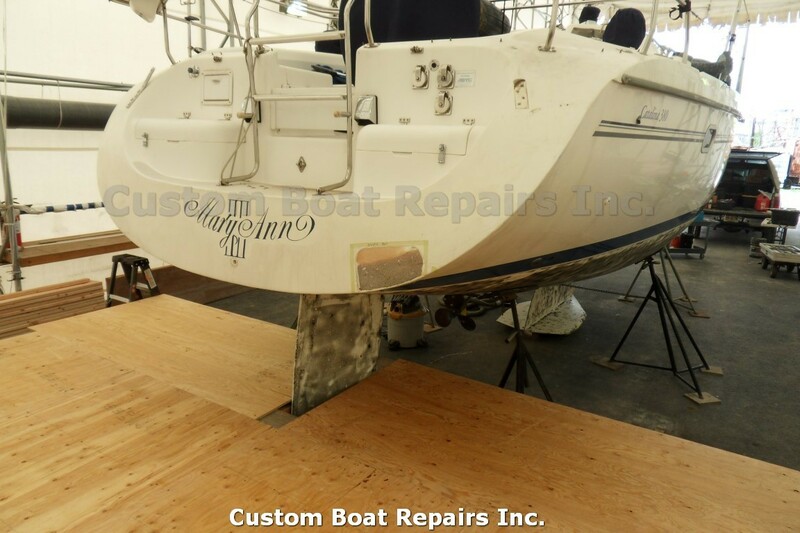 So I asked the owner if I could do a test grind on the transom. He said, "No problem. Let's see what's happening." 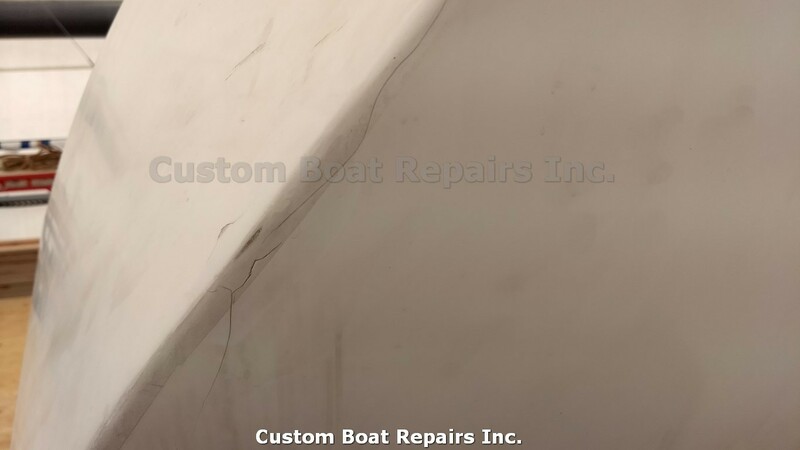 Well, I did the test grind and discovered that the transom had over a 1/2-inch of putty, which was very wet. The putty that the factory used was not waterproof! 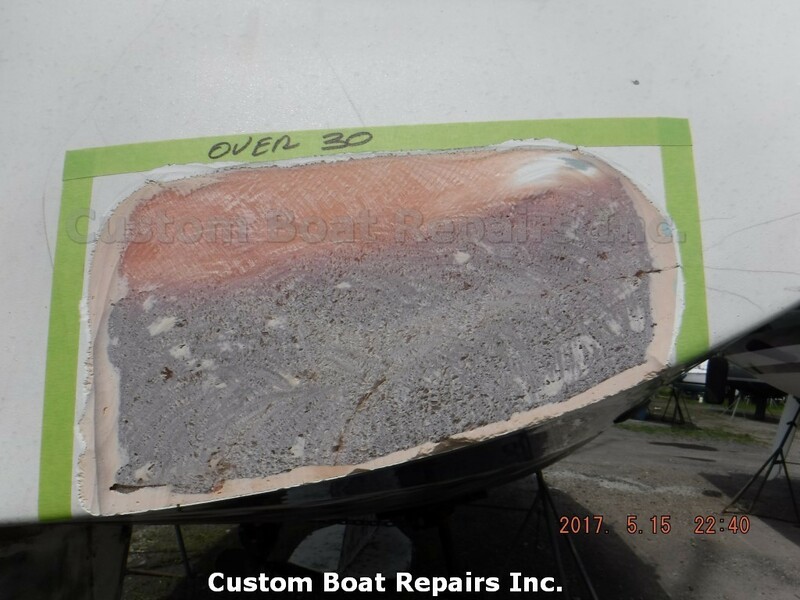 I see this a lot -- repair shops or factories using cheap body filler that's actually made for use on cars, being used on boats. 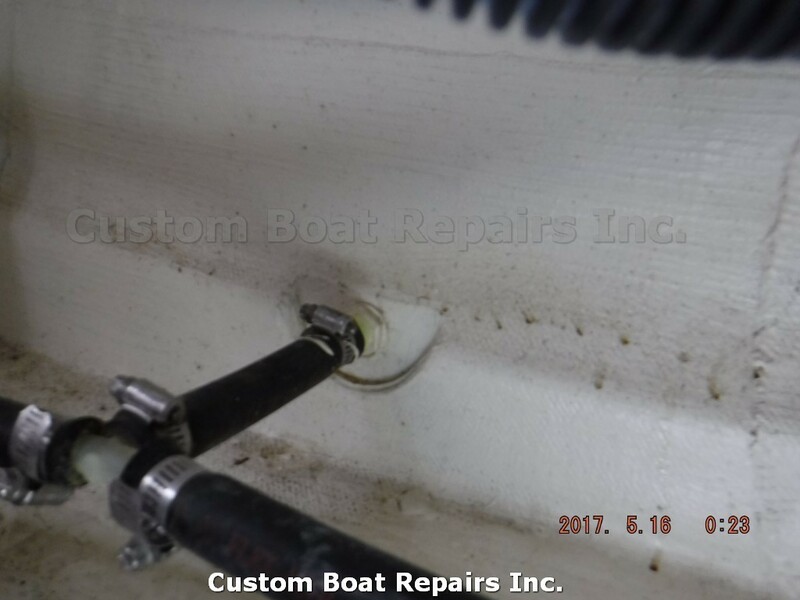 This cheap filler costs about $15.00 a gallon, compared to a waterproof marine filler that can run about $50.00 a gallon. The cheap filler contains talc. What's bad about this, is that talc absorbs water. So now there's moisture is in the filler and come winter, it crystallizes and freezes and in turn, expands the putty, creating cracks in the finish. 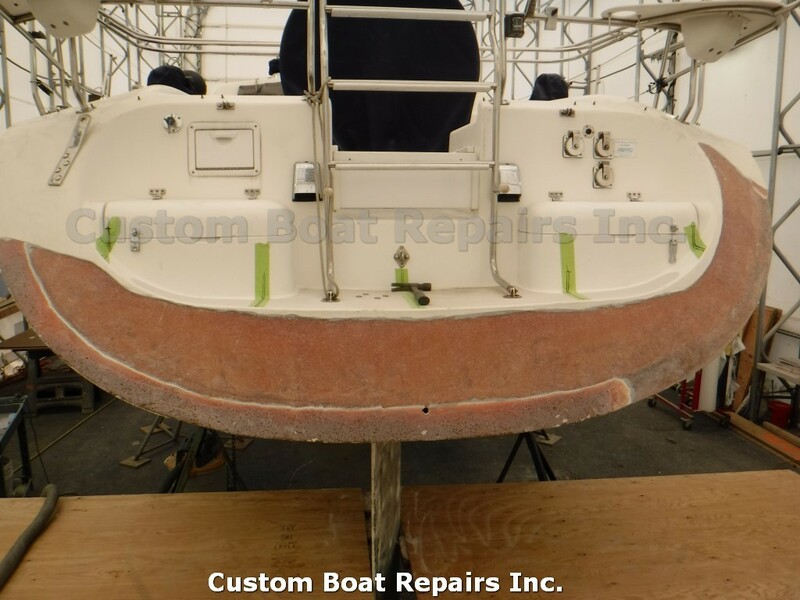 What I also realized was that the flat section of the transom was actually a cosmetic fiberglass panel. 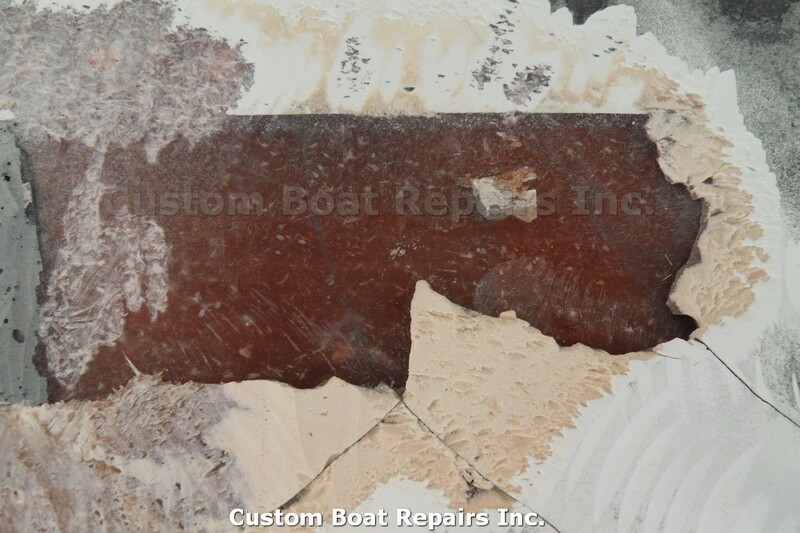 So when I ground the fiberglass down, I saw that there was a void between the cosmetic panel and the true transom, which was also filled with water -- which shot out all over the place. The factory had partially filled the void with putty, leaving the rest of the transom open to collect water. Let me just say that working with an electric grinder while getting splashed with water is not a positive experience. 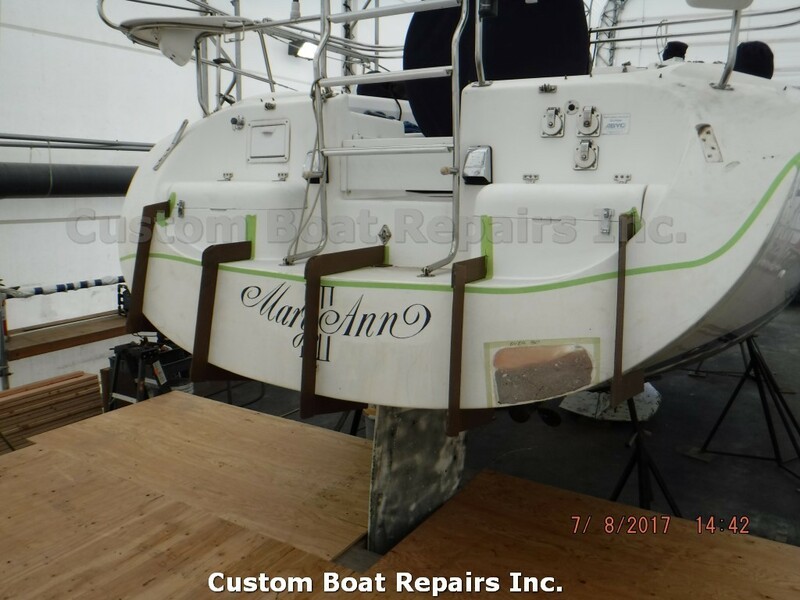 I opened up the starboard side only, and filled the void with a fiberglass liquid mixture to see how the section would hold up over time, per the customer's request. 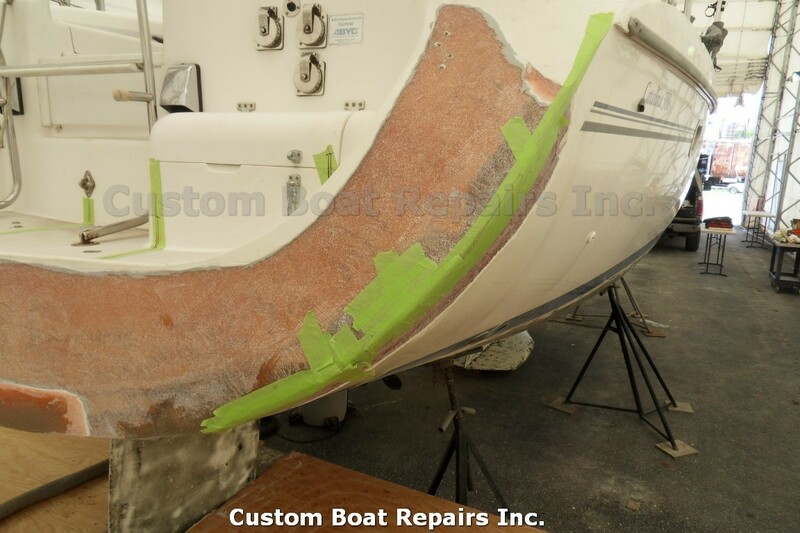 I then laid up the whole transom area with high-strength fiberglass. 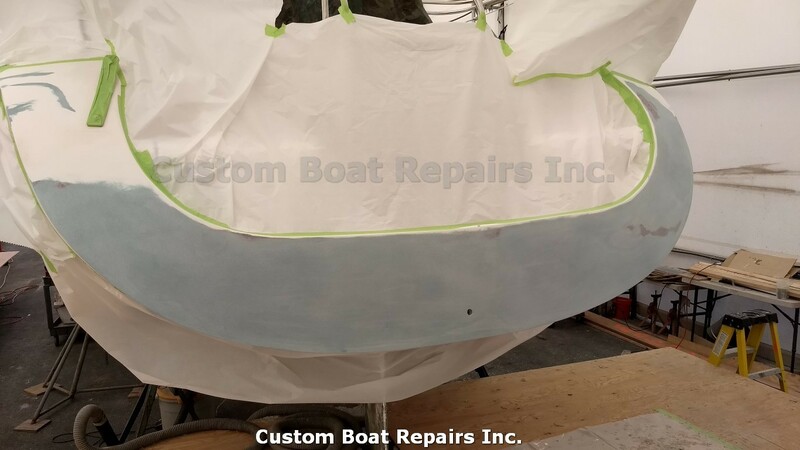 Next, shaping the fiberglass to the contour of the hull, I then sprayed a VE barrier coat and polyester finish to complete the job. During the repair process, the customer came down to the shop to see every step that I was performing, and he was very impressed with my technique. 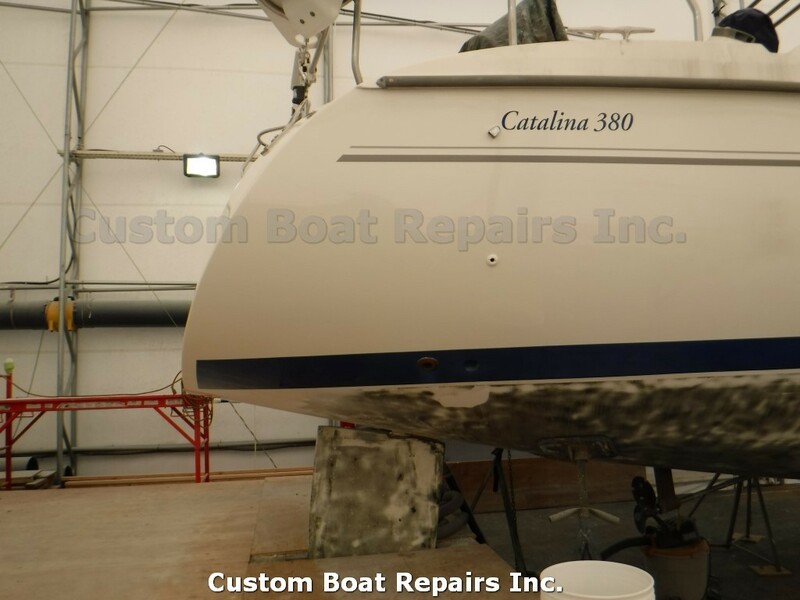 I completed this repair job last year, and it survived the winter without forming any new cracks. And just as importantly to me, the customer was very happy. 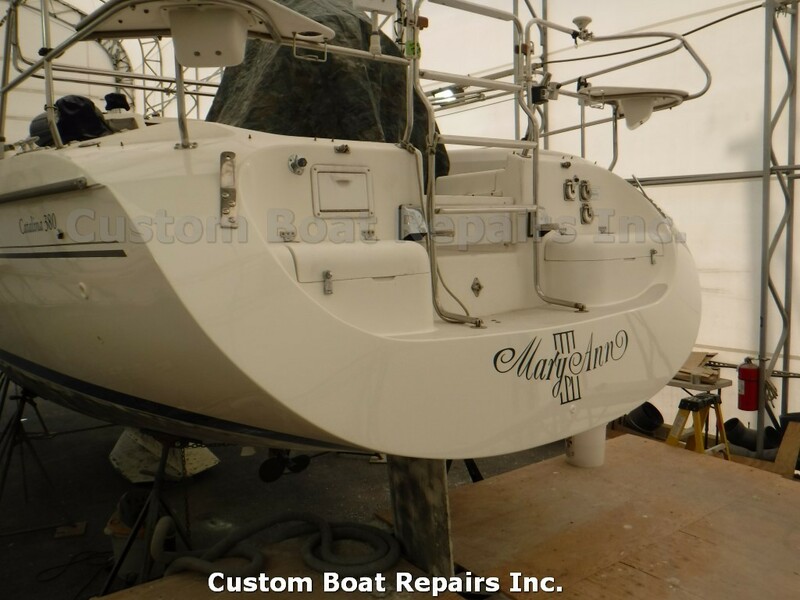 Now you'll see the step-by-step process I implemented during this repair project. 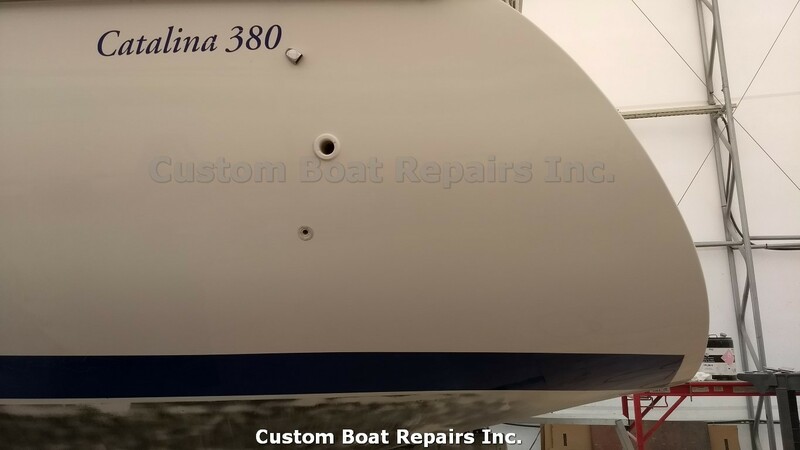 Here is the transom. You can see the cracks running up from the lip. 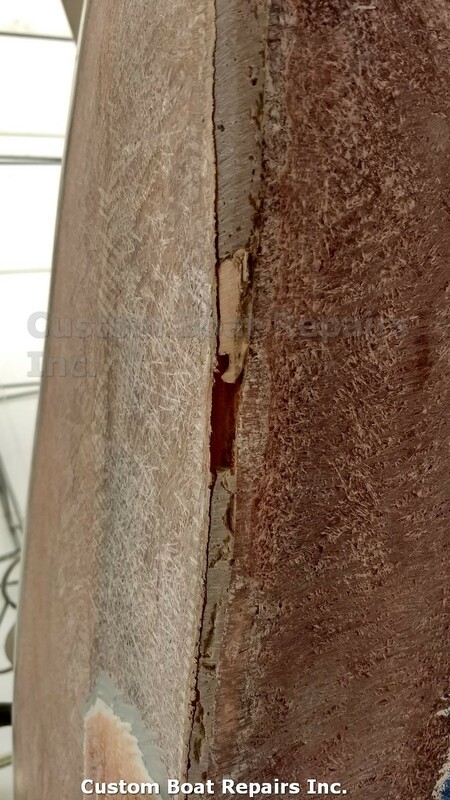 Close up of the port side cracks. This is the inside area (the cracks were on the outside). 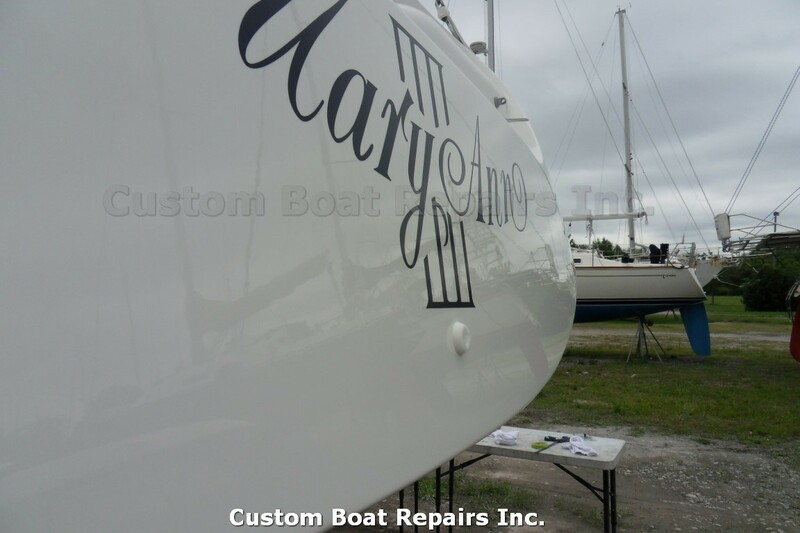 Everything looked good on the inside with no cracks in the fiberglass. I started to do a light grinding, and you can see where the owner started to notch the cracks and fill them in. Now I'm grinding deeper into the putty. See how all of the cracks were showing up? Also notice the pink area, where it's darker. This shows how the cheap putty absorbs water. 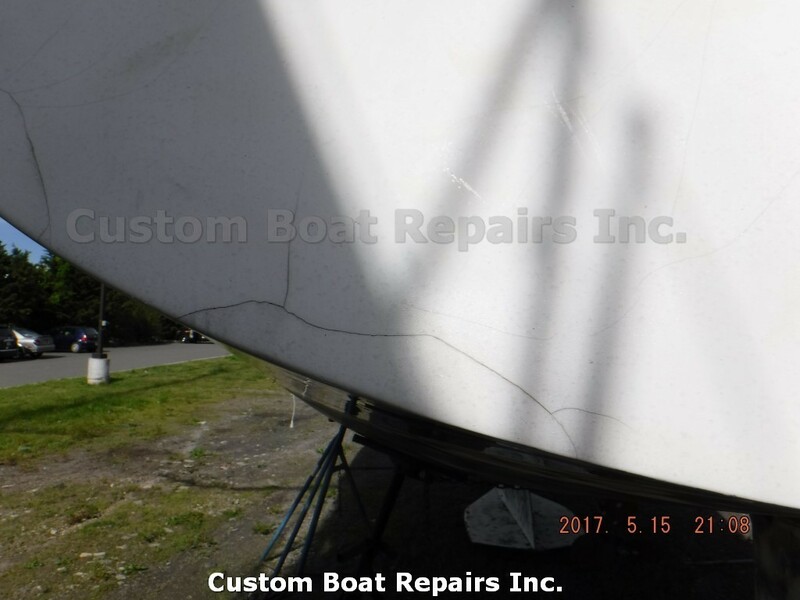 With all of the putty removed, the cracks in the fiberglass now visible. Look how thick the putty is -- over a 1/2-inch thick! This is on the bottom of the hull. The factory putty was falling off. 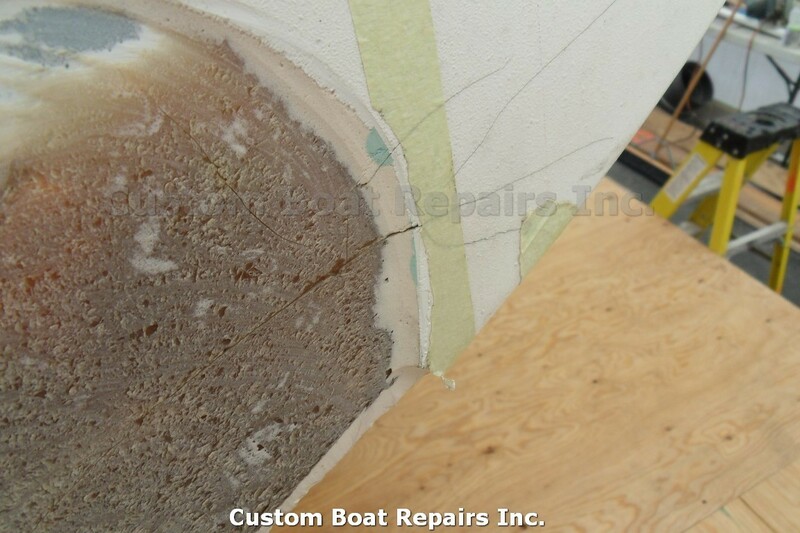 As you can see, the fiberglass surface was not prepped correctly, causing the putty to just fall off over time. 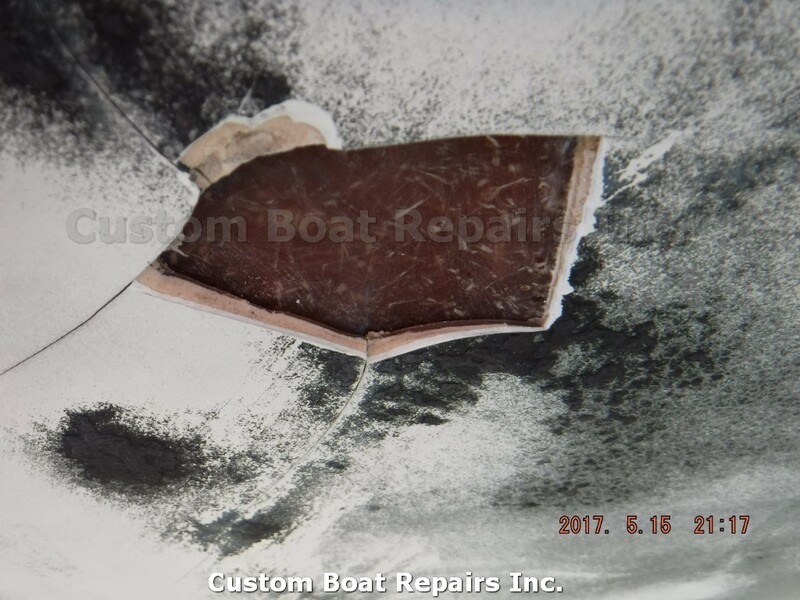 I started to pry off the putty, and it seemed like there was no end to it -- it was even going up the side of the hull, but peeled off pretty easily. 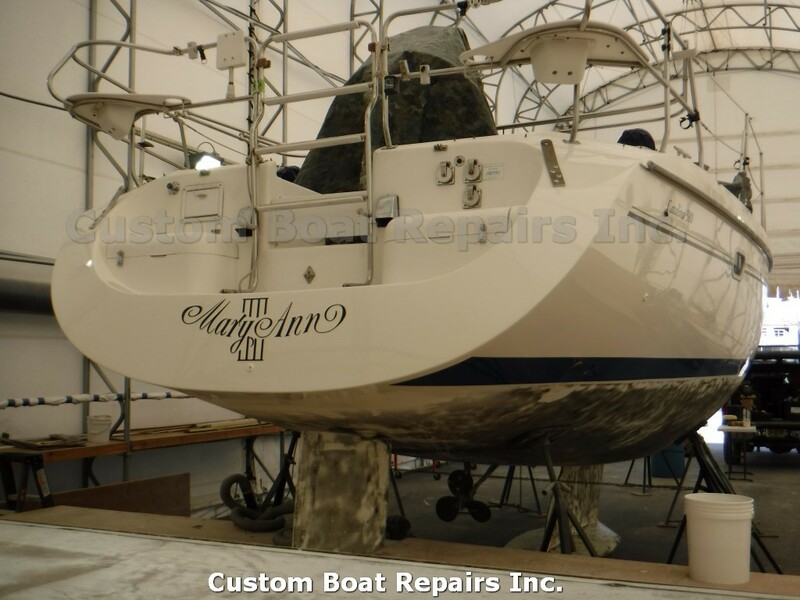 Here's the boat in my shop. 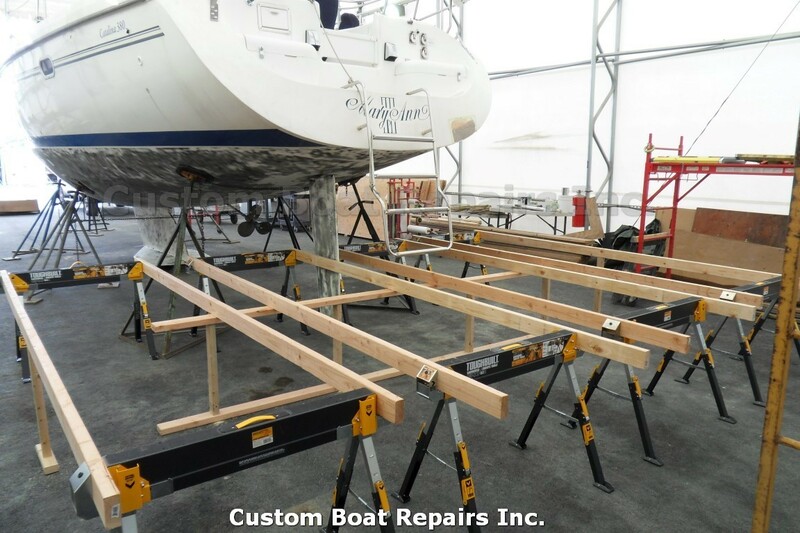 Building a platform to make the repair process more comfortable, because the more comfortable I am, the better the repair results will turn out. 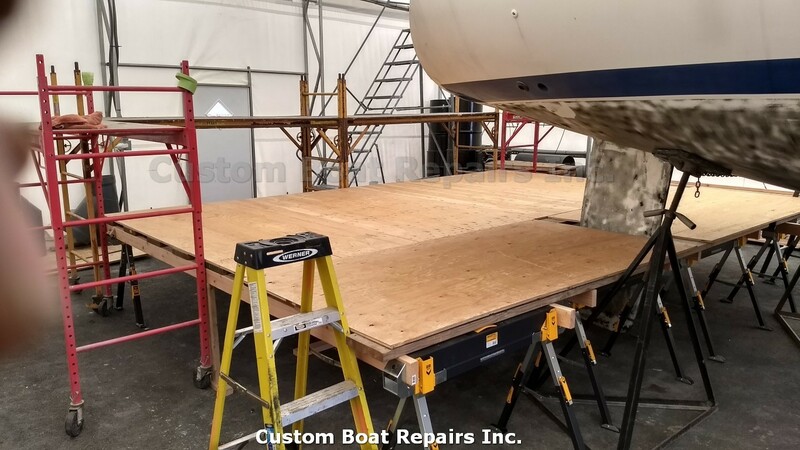 Covering the platform with plywood. With the platform done, it's a great working height for me. 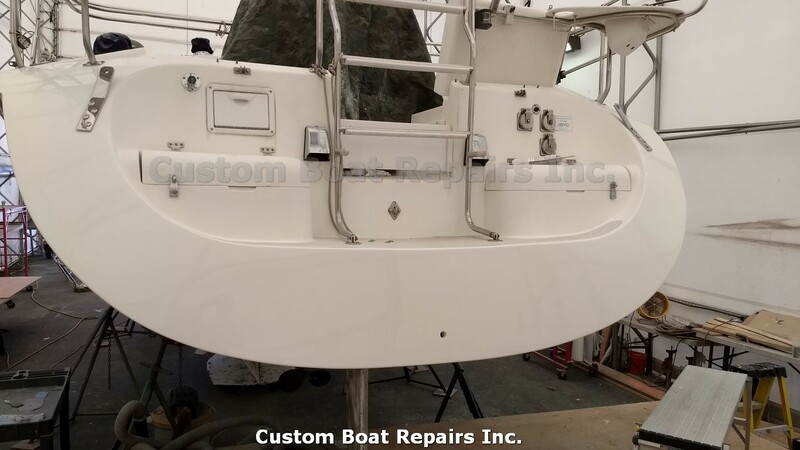 I made custom templates so I didn't lose the shape of the transom. 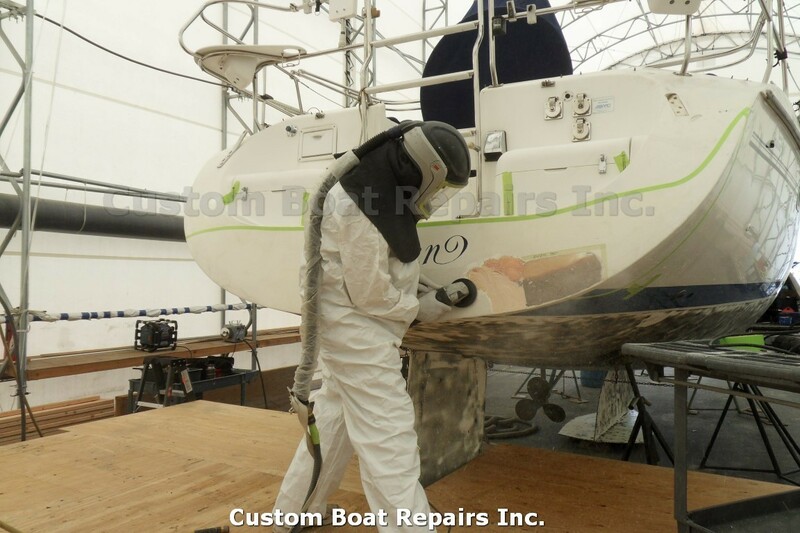 Next I got to work grinding the thick putty off of the hull. This is a close up of the putty, with the cracks running through it. All the putty taken off. 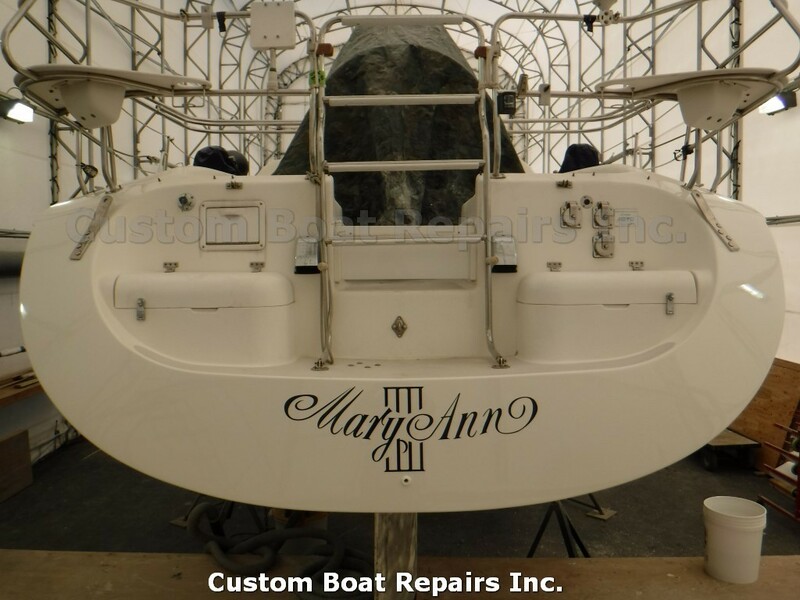 Here, you can see how this transom has what I refer to as a "cosmetic panel." Notice the void and how the manafacture tried to fill it. This is where the water came rushing out when I was grinding the putty off. I taped up the edge, made a liquid fiberglass mix, and injected it in the void. The dark areas in the photo are where the voids were. Now I'm laying a high-strength fiberglass on the edge. 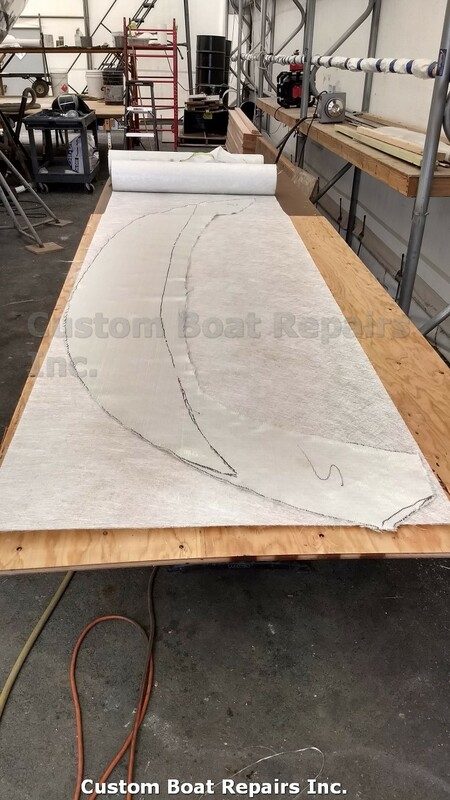 Laying out my custom templates to cut the fiberglass. 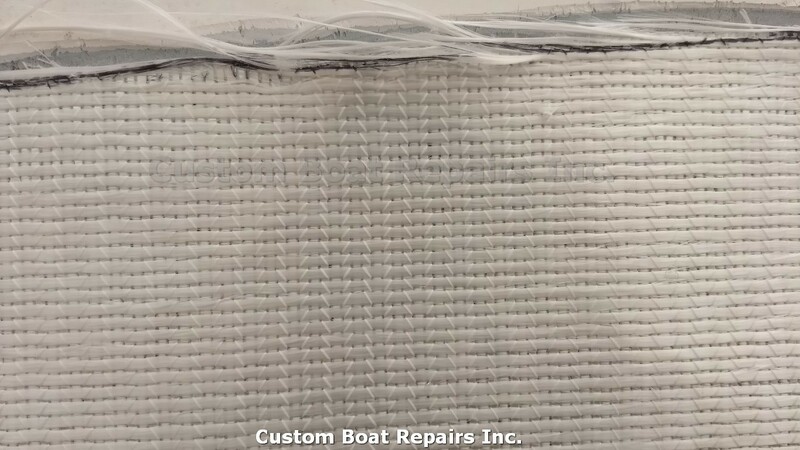 This is the fiberglass weave that I used for this repair job. 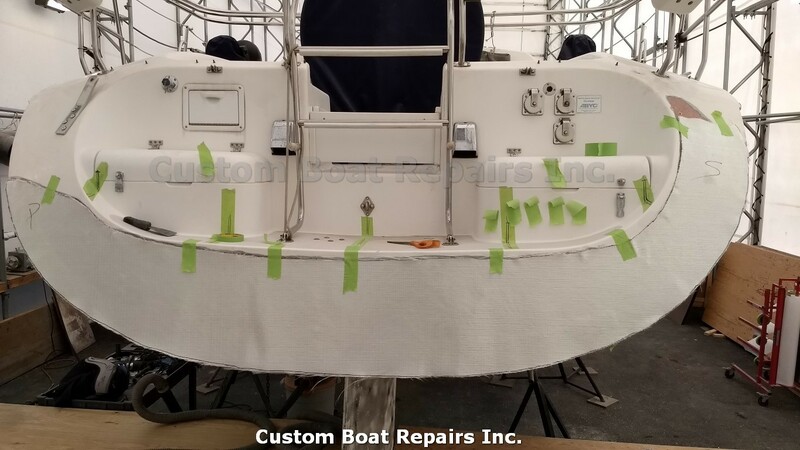 Test fitting the fiberglass sheet. 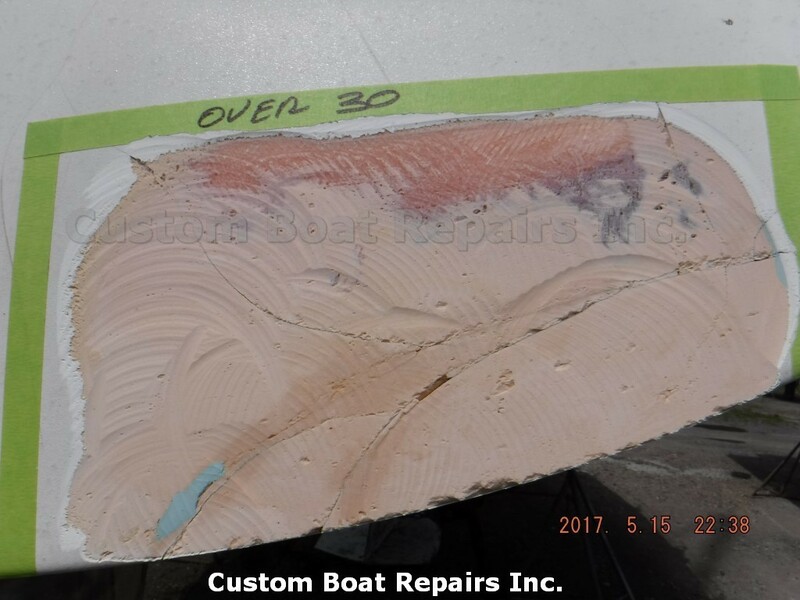 Multiple layers applied to transom. 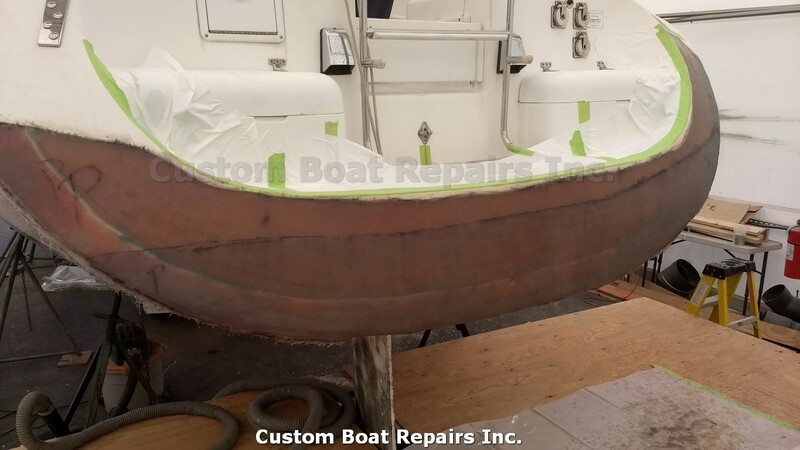 Transom flared off to original contour of hull. 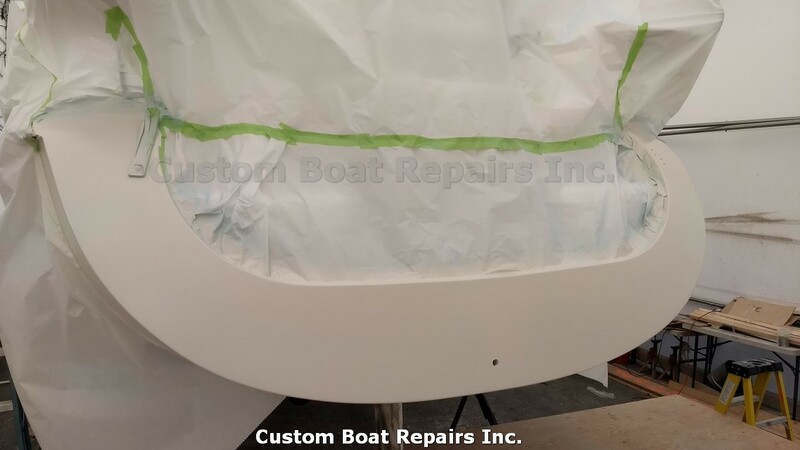 A vinyl ester barrier coat is applied to the transom. 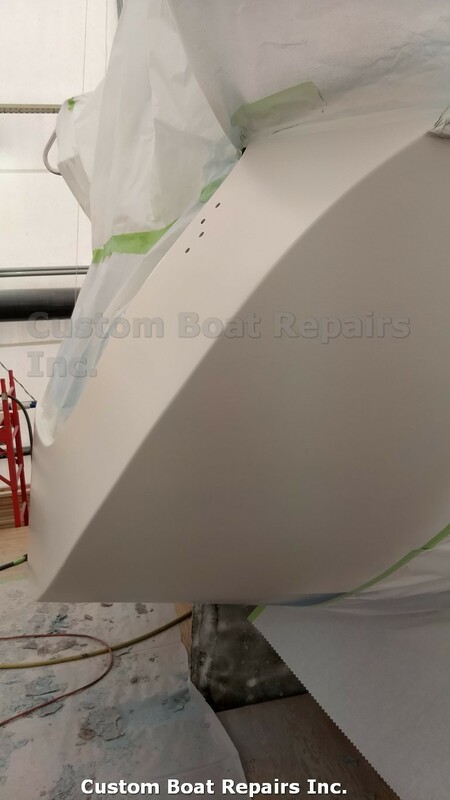 Transom sprayed with the final finish. Sides blended in really well. 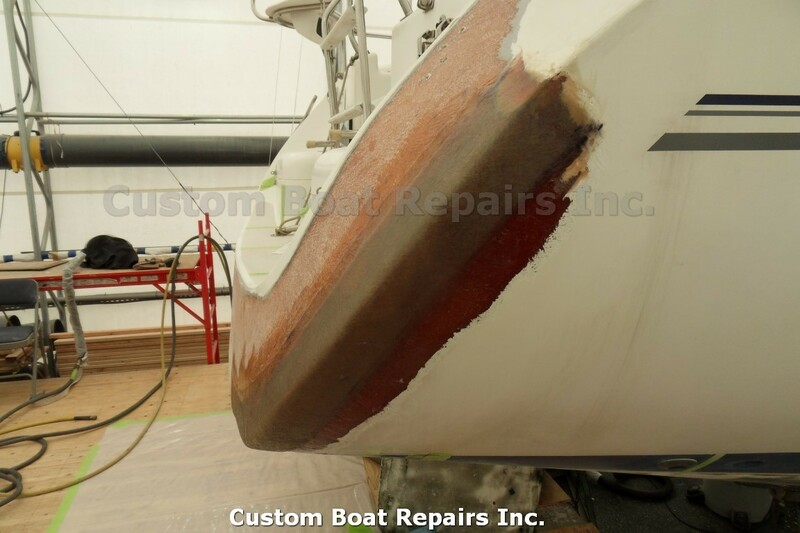 Waterline stripe was also sprayed in. Job complete. Check out the finish -- it's like a mirror! 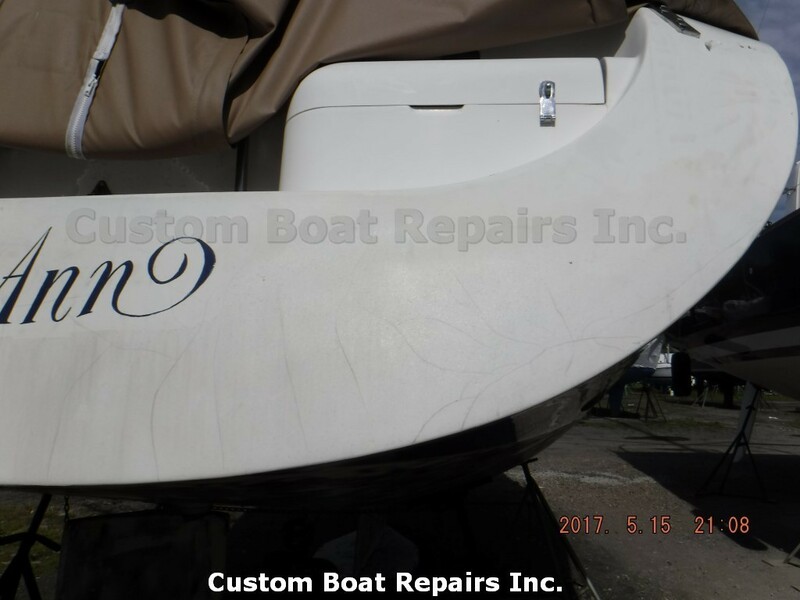 I had also made a stencil of the boat's name, and hired a company to duplicate it in decal form, which I then applied to the transom. The owner was very impressed -- he thought he was going to have paint it free-hand, like he did the first time. Outside transom view. Great reflection in the finish!